Wallpaper from the latest chapter's (182) centerfold scan from this Bleach fansite. Title: Enter the Next, signifies the transition to a new arch. : ) Everyone looks so sweet. Ishida & Byakuya would make great agents. yaay i have the same scan as wallpaper but no matrix-style xD i love this scan though and you did a nice good even if it's simple. very cool. Men in black look so awesome. I like the idea very much. Keep it up and thank you. Sycia-chan!!! I love it :), you're so talented, bravo ^_^. Great idea! this is such an awesome wallpaper. very matrix-ey and very professionally done. good job!! Kyaa ! Cool wallpaper ! I like the picture the most, even the color is not bad ! Thx for sharing ! 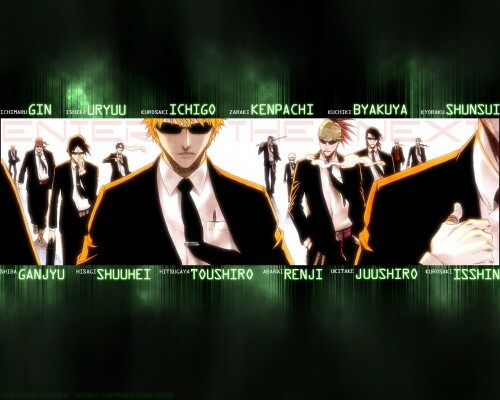 i agree ishida and byakuya would make great agents... XP great wllpaper Sycia-san! keep up the good work! Love this!!!! Hey I took a copy k? I just have to have this on my desktop! :nya: Thanx!!!! Thumbs up to the great job you did on this wallpaper. I definetly like the addition of the names of the characters, nice job on spotting who they where. I have to admit I was kinda lost. hE WIll bE THe bESt!!!!!!!!!!!!!!!!!!!!!!!!! This looks great. I have visited your gallery and all of your works are great.I don't expect nothing less from your work. Each new one surpass the last one to me. Well done. This wallie is really different from usual.